I recently ditched the kids to get some well deserved ‘me time’ by checking into a luxury yoga retreat in France. The Alps. 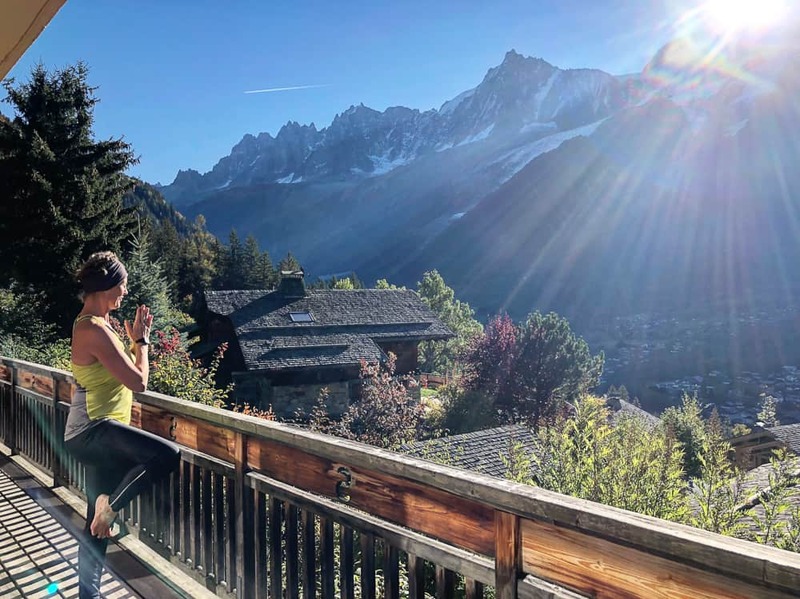 With unparalleled vistas over Northern Europe’s highest mountain – the mighty Mont Blanc, Bluerise Retreats have exploded onto the market with their blend of incredible retreats partnering yoga with adventure sports. 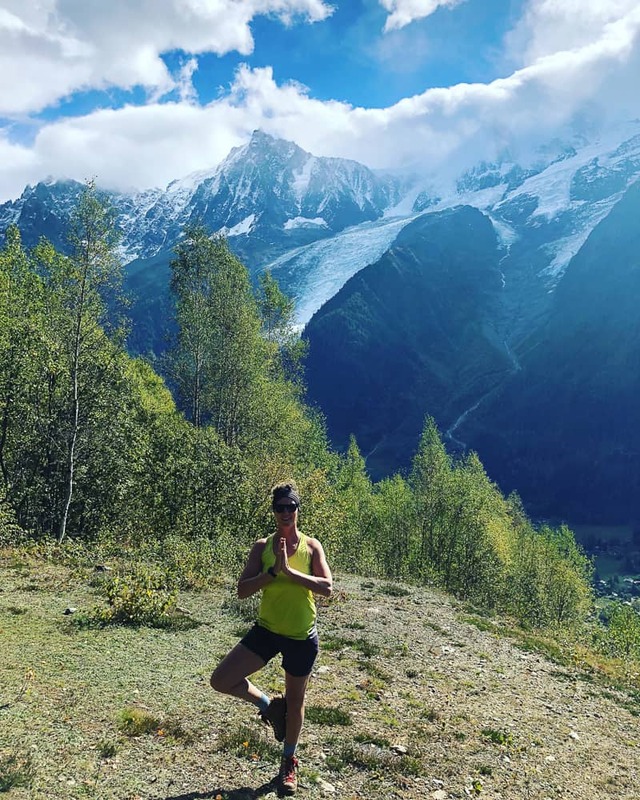 Trail running, hiking, snowshoeing and even a ski clinic all feature in Bluerise Retreat’s tailored yoga holidays which makes this the ideal destination for adventure mums needing a break. I’ve always shied away from yoga retreats. Flexibility isn’t my strong point and I was convinced one had to be a downward dog pro to go. Wrong! Bluerise Retreats has none of the pretentiousness that I had imagined a stereotypical yoga retreat to have. Instead I was faced with a bunch of friendly folk, from all walks of life, with a passion for the outdoors, a zest for life, and inspirational instructors – all in luxury mountain chic. Bluerise Retreats have carved out a niche in the market and totally get their clientele – which is why they are so good at what they do. The retreat is super laid back with no pressure. Phew! 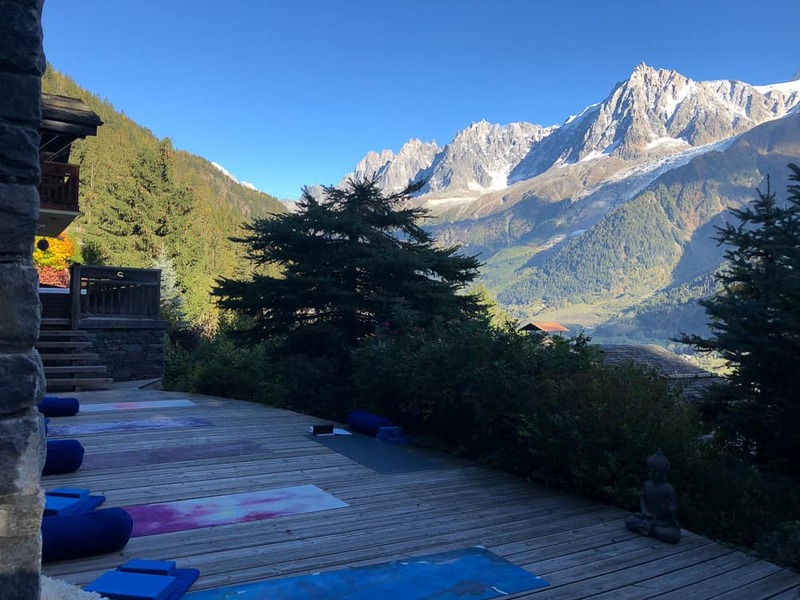 Yoga is practiced twice a day in either their ‘yoga den’ or the outside deck facing Mont Blanc. Hello big mountain! Bluerise Retreats fly in world class yoga gurus from around the globe all specialising in different genres of yoga. Combine this with the relaxed, cocooned environment the team have created with the spectacular, jaw dropping casual backdrop and well, you’ve almost got perfection. If you’re seeking a nurturing, cherishing environment to rejuvenate and re-find your inner zing, this place is for you. Looking to take a yoga mat with you on your travels? Read 7 Best Travel Yoga Mats. The outdoor deck of Bluerise Retreat’s luxury chalet is the perfect place to practice. Breathe. Relax. Talk about luxury – the chalet oozes it. The outside deck facing Mont Blanc boasts a bubbling hot tub – perfect for soothing aching limbs & soaking up the mountain vistas. The chalet is classic alpine – a profusion of wood & glass, a vast open fire, cosy sofas, a private cinema and incredibly even a slide down to the games room! The in-house spa, with a full size hammam & sauna, is at your disposal 24 hours a day and there’s a fabulous masseur on hand to ease quite literally every last ounce of stress from your body. At 1300 metres above sea level, Chalet Serena is tucked away in the fir trees high above the valley floor with spectacular views of the Mont Blanc massif mountain range. This is the Alps at it’s best and watching the scenery evolve with the weather systems and clouds billowing over the famous snow capped dome is mesmerising. The hot tub on the chalet deck has outstanding views over Mont Blanc. But what makes a holiday so special and memorable is as always, the people. 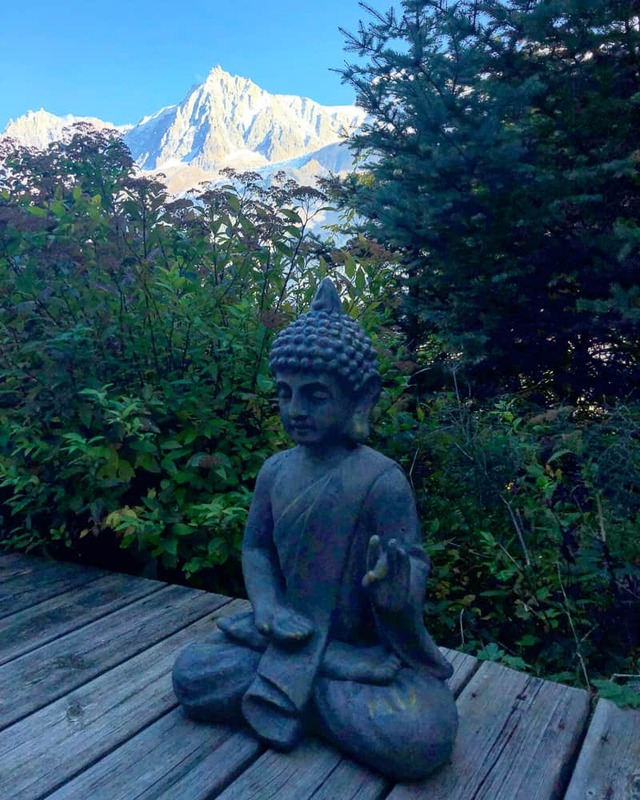 Eleanor, the founder of Bluerise Retreats, and her team are uber friendly and welcoming, so don’t worry if you don’t know your savasana from your vinyasa. Beginners are welcomed and Anna, our yoga instructor for our retreat was down to earth, approachable and truly inspirational. Twice daily yoga sessions are included with mornings kicking off with dynamic Vinyasa flow to empower our day whilst gentle, restorative yin yoga or meditative yoga nidra round off our day. Mouth watering vegetarian and vegan food are provided by the unpretentious five star chef (who has catered for rich and famous bods around the world). Wearing a huge smile on his face, Johno welcomes anyone into his kitchen to watch, learn, ask questions or just to hang out. 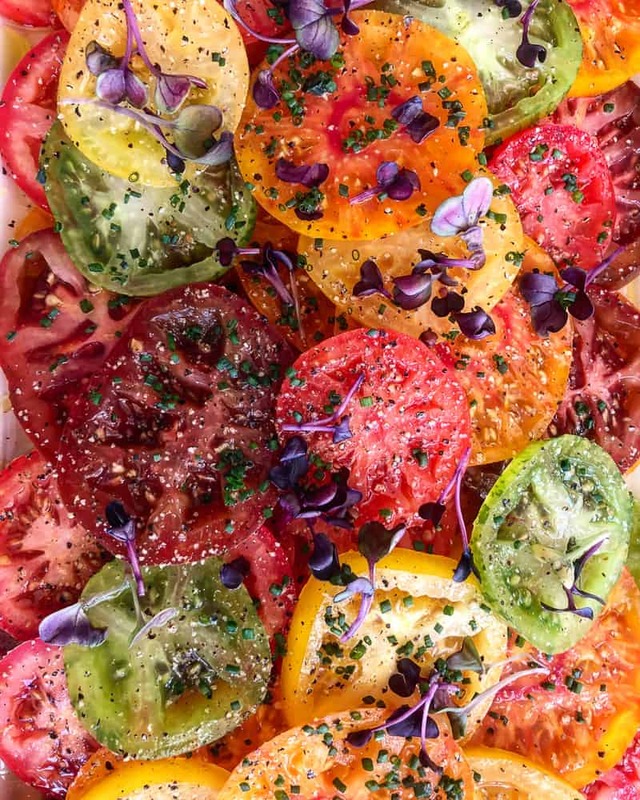 There he creates the most sensational healthy, beautifully served up vegetarian dishes, but is happy to throw in a few sides of meat for any carnivores upon request. Not that it’s necessary – the food is, in one word – exceptional and definitely an unexpected highlight of the retreat. 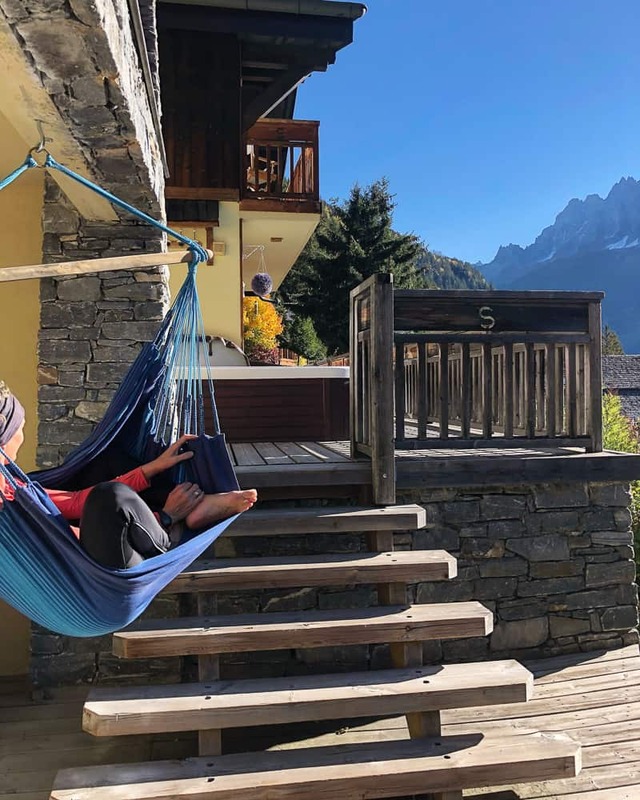 Chalet Serena has seven luxury en-suite bedrooms (doubles or twins) all facing the majestic Mont Blanc with balconies or decking areas outside perfect for quiet contemplation or reading a book. Drink in the mountains, for peaks soar high above at every turn. This truly inspiring landscape is guaranteed to provoke a change of attitude, ever more positive for gazing at their incredible stature. If you ever need an appreciation moment, this landscape – boom, will serve it up. The vibe is uber relaxed with the schedule being flexible. Morning yoga practice start either at 8am or 8.30am with a huge buffet breakfast waiting for us at 10am. The retreat price includes a one hour massage with the in-house masseur who was shockingly good. I spent the entire hour in heaven hoping it would never end. Ness, a qualified physio blends a fusion of massage techniques from reiki to Swedish massage to deep tissue and managed to ease out all of my aches and pains. After breakfast we’re off hiking through the fir trees beyond the chalet and into the forest. Expert hiking guide, Suzy, leads up on a high alpine trail and chats to us knowledgeably about the surrounding mountains, pointing out and identifying bird calls and bombarding us with incredible facts – I never knew the woodpecker had a tongue that wound around it’s brain whilst hammering a tree trunk! 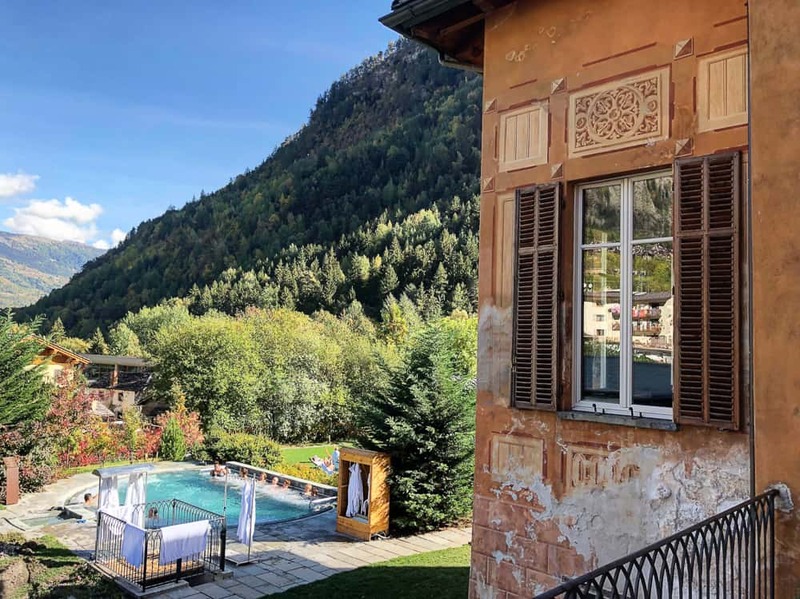 On our last day of the 4 day retreat we’re whisked over to Italy, a mere 20 minute drive through the Mont Blanc tunnel, to the world famous spa at Pré Saint Didier. I’d been told that it was impossible to try out all the various hammams, relaxing rooms, and bubbling thermal baths on one visit. In a 5 hour visit!? Really? Guess what – they were right! I was taken aback by the sheer size of this spa nuzzled in the bottom of v-shaped valley with impressive mountain views. Padding around this Italian spa bare foot, clad in a cosy fluffy white gown is the epitome of de-stress. Thermal waters steeped with healing qualities fill a myriad of open air pools, some boasting underwater music, others with power water jets or frothing bubbles. Indoor, loose yourself in a labyrinth of pools, saunas and hammams. Who knew hammams came in such variety? 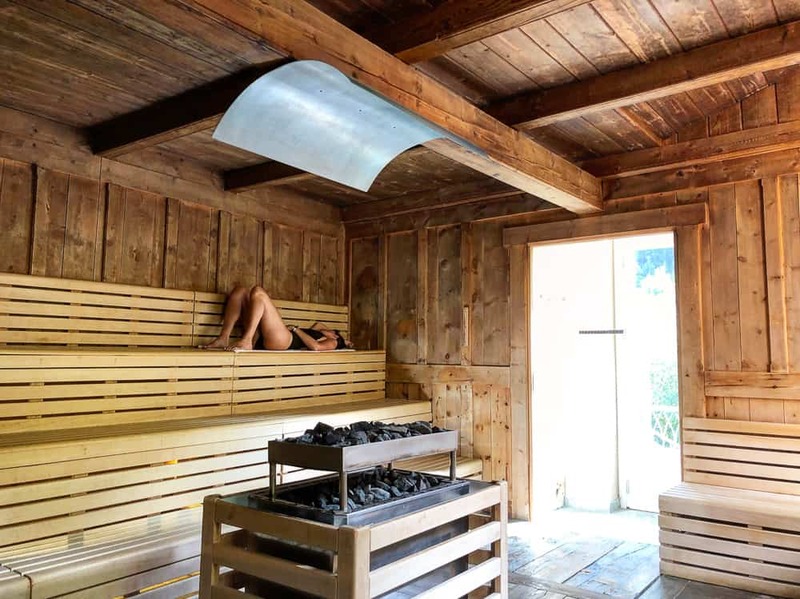 Himalayan salt rubs, eucalyptus steam rooms or traditional hammams. Relaxation rooms include various sleep rooms, a cloud room, a tree room whilst rows upon rows of reclining loungers face south on the lawns to bask in the sunshine. This 3 night retreat certainly gave my aching body and weary mind the well deserved service it so desperately needed. It was heaven to switch off from the family and take a few days to concentrate on me. Having not yet re-introduced yoga into my life since my ACL snap almost 18 months ago, I was delighted the way my body responded to daily practice. Stiffness eased into (semi) fluidity and I’m now determined to carve out time for practice in my daily routine. Bluerise Retreat’s are the perfect yoga holidays for adventure mums to re-charge those depleted batteries, hang out with like minded souls and find your inner zen. For me, as a yogi holiday newbie, Bluerise Retreats has set the bar high and man do I want more! 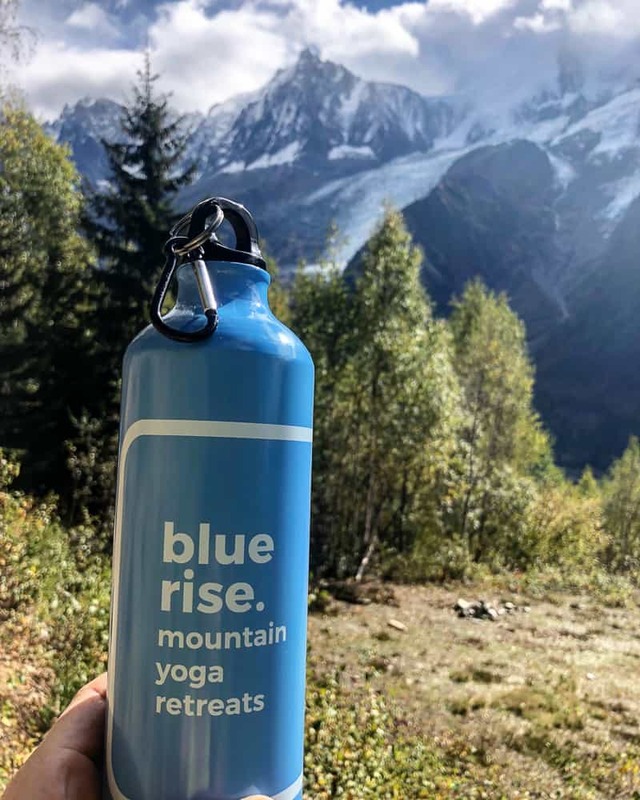 If you’ve never been on a yoga retreat before, but have always fancied it or wondered whether it’s for you – all I can say is that with Bluerise Retreats, you’re certainly in good hands. Many of the lovely people I met were there by themselves and were welcoming unconditionally. This taster retreat has certainly fired me up to indulge in a restorative, mindful me week once a year – something every adventure mum definitely needs! 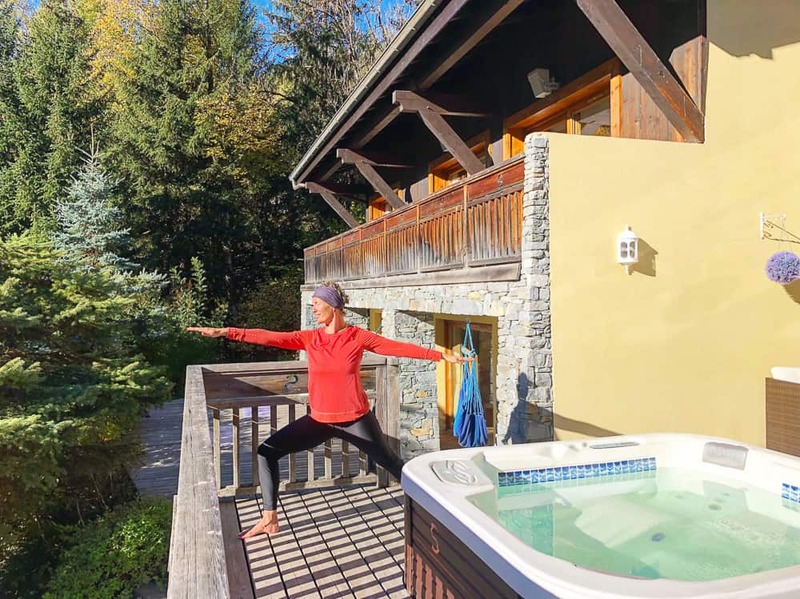 Find our more information on this yoga retreat in France through Bluerise Retreats by checking out their website and seeing which of their fabulous courses, be it snowshoeing, skiing or even I believe a French language slash yoga floats your boat. Retreats start from £985. Call Eleanor on ‭+44 (0) 20 3290 0503‬ to ask questions, book or find out more about a particular retreat. Disclaimer: My place on this yoga retreat was given complimentary by Bluerise Retreats for the purposes of this review, however all opinions are entirely my own and completely honest.